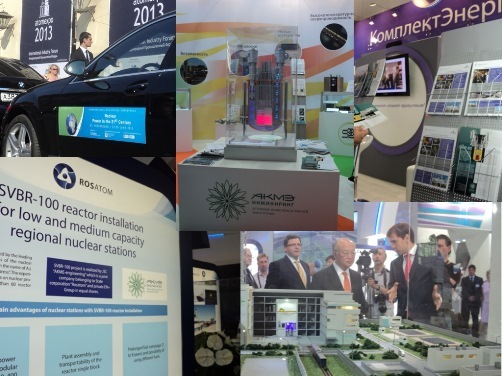 St. Petersburg hosts the V International Industrial Forum ATOMEXPO-2013 from the 26th till the 28th of June 2013. This year it anticipates the largest-ever international atomic conference of the International Atomic Energy Agency (IAEA) "Nuclear Energy in the 21st Century," which opens on 27th of June and in St. Petersburg. AKME-engineering is demonstrating its SVBR-100 project at the exhibition stands of the State Atomic Energy Corporation "ROSATOM" - as one of the two shareholders, and of JSC "Science and Innovation". The latter brings together the scientific division of State Atomic Energy Corporation "ROSATOM". SVBR-100 Project is also presented at the stand of the group of companies "KomplektEnergo" which is involved in development, manufacture and supply of steam turbine with additional equipment for the SVBR-100 reactor experimental production unit. 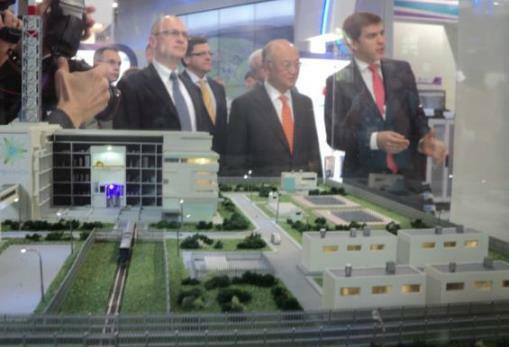 One of the first visitors of the exhibition were Yukiya Amano, IAEA Director General and Sergey Kiriyenko, Director General of State Atomic Energy Corporation "ROSATOM". The opening ceremony was attended by Kirill Komarov, Deputy Director General for Development and International Business of State Atomic Energy Corporation "ROSATOM", Jacques Regaldo, the Chairman of WANO Operators, Peter Faross, Deputy Director General of the Department of Energy of the European Commission and Agneta Rizing, Director General of the World Nuclear Association.